The Environmental Impact of Wind Energy and Wind Turbines on rural and local communities has become surprisingly controversial and a hot topic in both the news and the press. The thought of generating electricity from a free source of energy, the wind, seems like a good idea and one positive way of reducing our dependence on fossil fuels. But the generation of electricity from wind energy using large numbers of wind turbines can disrupt both landscapes and habitats, as well as the rotating turbine blades can sometimes kill birds and bats. Whilst wind energy is a clean technology, it can have a negative impact on the environment. Wind energy has little to no damaging affect on the environment in the way that other energy sources do, such as coal, gas, oil and nuclear generated power, but wind energy systems ranging from an individual wind turbine on a house roof to small-scale groups of turbines in a field to vast wind farm facilities comprising of many hundreds of turbines can be to some an environmental eye sore. Wind power generation is generally done in remote areas so it is therefore important that such turbine designs are properly located and sensitively developed for minimum impact on the environment. Wind energy has proven to be incredibly popular lately and with governments and environmental groups around the world pushing the “green” agenda, it has come under some scrutiny as to its environmental impact. We know that wind energy is created from converting wind into electricity so that it can be used as a power source and that the wind is actually a dissipated type of energy, in keeping with many other renewable energy sources. Wind power is great in that it doesn’t put out any air pollution contributing to causing global warming and climate change, and doesn’t need any fuel to create the power, only wind. Many people around the world are now starting to see the benefits of this and are building wind turbines at their homes to get off the dependency of the electrical company, but herein lies the problem. The saying goes that “beauty is in the eye of the beholder”, and attitudes towards wind turbines depends upon the aesthetic judgements made towards their beauty, aesthetics and people’s preference which are subjective as not everyone considers them beautiful. The visual impact on the environment can be minimized through careful choice and design of the turbines. For example, using wind turbines of the same size, height and type and spacing them uniformly across the land generally results in acceptance of most of the aesthetic concerns. Building wind energy installations with large numbers of turbines can disrupt landscapes, such as visibility at a distance, and its the aesthetics of the landscape that is often a primary reason for people’s concern about siting new wind energy projects. To some, wind turbines appear visually pleasing, while others view them as intrusive industrial machines. Its the thought of change to the local surroundings and landscape that affects most people, but if you asked them which would they rather live near too, the smoking chimneys of a coal fired generating station, the cooling towers of a nuclear plant, or a wind farm, many would choose the latter. But wind energy installations can create both positive and negative recreational impacts on the environment. On the positive side, many large wind energy projects are listed as tourist attractions with some sights offering guided tours or providing information about how wind turbines work or about wind energy in general. Some wind farm sites even allow open access to the public providing additional opportunities for camping, hiking, and other such leisure activities. The vast majority of wind farm projects are located on private farmland. As an average wind farm of 20 turbines may expand to well over an area of one square kilometre, yet less than 5% of the land area would be used by turbines. The rest can be utilised for some other functions, for example agricultural, farming. Then wind turbines can safely co-exist with other living creatures, which means that the land does not have to be restricted from other possible uses. The land of a wind farm can be used for wind generation, but also for crops growing, animal grazing, or maybe left as a natural habitat reducing its impact on the environment. As well as the visual effects on the environment, wind turbines and wind farms can have negative impacts on human health and well-being especially on those people living near wind turbines who are affected by their noise. 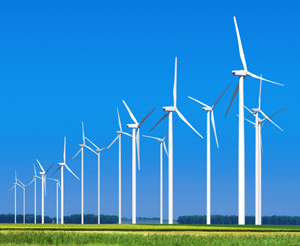 Like any machine that has moving parts, wind turbines generate noise during their operation. Noise from wind turbines arises mainly from two main sources: (1) mechanical noise from the rotation of the gearbox and electrical generator, and (2), the aerodynamic noise caused by the interaction of the turbine blades with the wind as they rotate. Noise emission used to be a problem with a few of the earlier wind generator designs, however modern day wind generator designs are much better to the point where mechanical noise produced by their rotation has become insignificant. Therefore the concern of noise pollution in the environment has become one of aerodynamic noise or whooshing sound from the flow of air over the rotating rotor blades. Many modern turbines designs have improved aerodynamic noise simply by changing the width of the rotor blades trailing edges and also by having the blades face “upwind” as opposed to “downwind” of some of the earlier designs. Noise (sound-pressure) levels from a wind turbine generally increases with wind speed as the wind strikes the actual rotor blades first. In addition to the amplitude of the noise emitted from turbines, its frequency content is also important. As the blades rotate faster a “swishing” or “whooshing” sound results from the continuous rotation. Also, low-frequency noise and vibrations can have an effect on animals and the local wildlife. While both the mechanical and aerodynamic noise can be loud enough to be heard by people, it is often camouflaged by additional ambient noises such as the movements and rustling of tree leaves when the wind picks up, or when operating in close proximity to an industrial or urban center or location. Another wind turbine effect on the environment and those people living near to a wind farm installation is that of shadow flicker. As the turbines blades rotate in sunny conditions, they cast moving shadows on the ground or on nearby residences resulting in alternating changes in light intensity depending on the time of the year (which itself determines how low or high the sun is in the sky) and time of day. When related to wind turbines, this effect is known as shadow flicker. Shadow flicker is caused by intermittent chopping of the sunlight behind the rotating blades which casts a shadow that appears to flick ON and OFF as the wind turbine blades rotate. The amount of shadow flicker is dependant upon several factors, including the location of people relative to the turbine, the wind speed and direction, the variation in the sunlight. Shadow flicker can be a nuisance to nearby humans, but it is possible to calculate very precisely whether a flickering shadow will in fact fall on a given location near a wind farm, and how many hours in a year it will do so. Reflectance, also known as blade glint, is the opposite of shadow flicker in that the sunlight is reflected of the blades surface. Reflectance is caused by the intermittent reflection of the sunlight in front the rotating blades which reflects the light at a given angle as the wind turbine blades rotate. Blade reflection of the sunlight, which can be visible for some distance on a bright sunny day has the potential to annoy people. It is possible to reduce the amount of reflection by careful choice of blade colour and surface finishes. Although wind turbines are great renewable energy producers, they can have a negative impact on bat and bird populations. Wind turbines cause fatalities amongst bats and birds through collision, most likely with the turbine blades. While different species differ in their vulnerability to collisions with the blades, many dead bats and birds have been found in and around wind energy farms, and not surprisingly their discovery has sparked outrage among many environmentalists, wildlife and ecology specialists. Bats which are nocturnal creatures, fly around at night using echo-location to feed and navigate. When they encounter the fast moving blades of a wind turbine, they are unable to safely manoeuvre around them quickly enough and are often times hit by the rotating blades and killed. Even when bats are not directly hit by the wind turbine blades, they can still be killed by the changes in air pressure created as the blades rotate. Although bat and bird deaths have raised concerns over the safety of wind farms, there are many ways to prevent such occurrences. Many of the early wind farms were planned, constructed, and operated with little or no consideration for the potential impacts to birds or bats. Today, new wind farm installations are designed with not only bats and birds in mind, but with other local animals and insects too. Better wind turbine designs that rotate at slower speeds and predator noises used to deter bats from entering wind farm areas are all helping to reduce fatalities. However, no matter how extensively wind energy is developed in the future, bird and bat deaths from wind turbines is unlikely to ever reach as high as those from other human related sources such as hunting, shooting, cars and bad building design. The environmental impact of wind energy and wind turbines depends to some degree on the environment and people’s predilections. It is true that wind turbines can disrupt landscapes and habitats, and the rotating turbine blades sometimes kill birds and bats, but with better wind turbine designs, better thought and planning of proposed wind farm locations, the generation of electricity from wind energy has a bright future. How do wind power companies exactly make business? Does anyone know? What I mean is, first of all can they just decide to build a wind turbine somewhere, if they purchase the land area, or do they always build on request of the government? After building the wind turbines, do they get to keep them and earn the revenues of the electricity produced or are the turbines owned by the state and they earn the revenues?